A film set entirely in Ancient Egypt and filmed entirely in...Poland, of all places. Director Jerzy Kawalerowicz recreated Egypt in his home country, with Polish actors. It's really interesting for this aspect alone. The film is spectacular but, like most art films, detached and a bit cold. Many might decry this as cultural appropriation but then are there any direct descendants of Ancient Egypt who are still alive today? Not in Poland. Filmed in Egipt. This is not decoration, this real monuments. Some scenes were shot in Egypt but they had to abandon filming there. "Pharaoh's production took three years, beginning in the fall of 1962 with the setting up of a studio in Łódź which did in-depth studies of the costumes and realia of life in ancient Egypt. Filming took place in Europe, Asia and Africa. Most of the indoor scenes of the pharaoh's palace, the temples and the Labyrinth were shot at the Łódź studio. The Warsaw River Shipyard built an Egyptian ship according to drawings from 4,000 years ago. An artificial island was created on Lake Kirsajty, near Giżycko, Poland, and planted with palms and lotus for the scene involving Ramses' row on the Nile with Sara. Mass scenes were filmed mainly in Uzbekistan's part of the Kyzyl Kum Desert. Some scenes were filmed at authentic Egyptian locales. 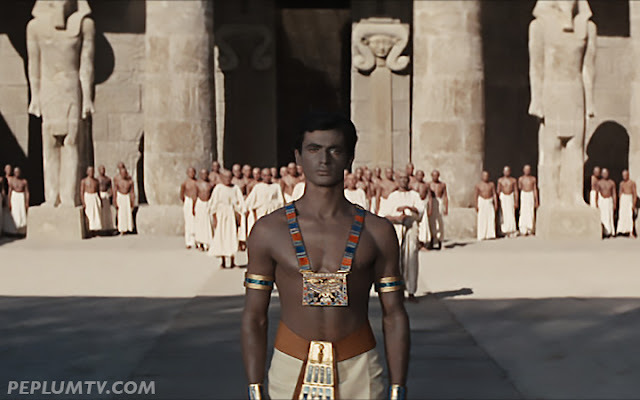 For example, the scene in which Prince Ramses learns that his father Pharaoh Ramses XII has died and that he has now become Pharaoh Ramses XIII, takes place against the backdrop of the pyramids of Gizeh; but the crowds of tourists and the present-day appearance of the area made it near-impossible to find good takes." So they had to recreate Egypt in Poland because there were few good takes from location shooting.